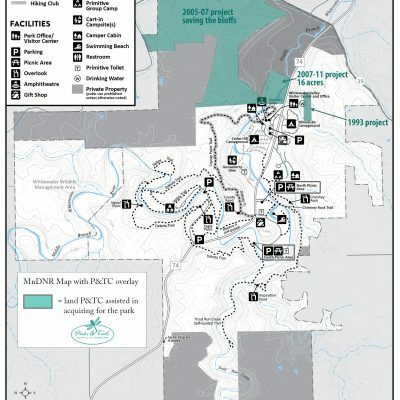 Since our founding in 1954 we’ve helped acquire more than 10,000 acres for parks and trails in Minnesota. Sometimes creating a whole park or trail from scratch, but more often adding critical land within an already established park or trail corridor. 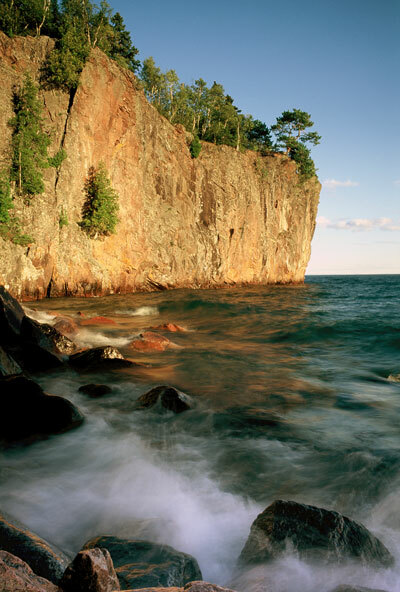 Land of outstanding outdoor recreation quality is not cheap. But such land has incredible opportunities that everyone should have the chance to benefit from. 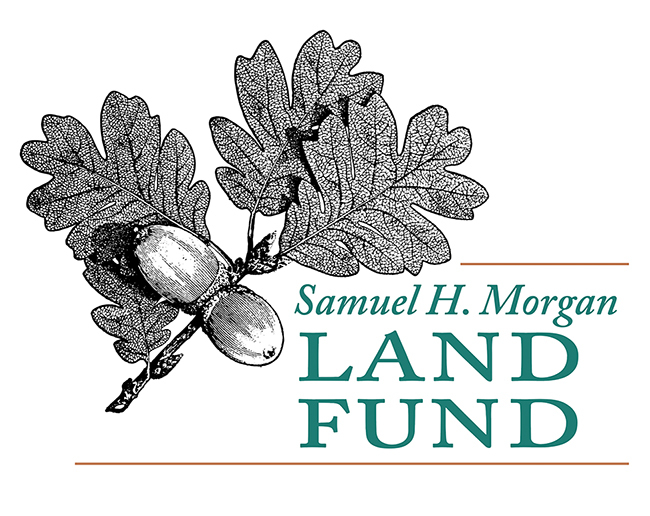 Our Samuel H. Morgan Land Fund provides the necessary funds to ensure we can purchase critical land when it’s urgently needed. We undertake new land acquisition projects each year that have important benefits that will be felt for generations to come. 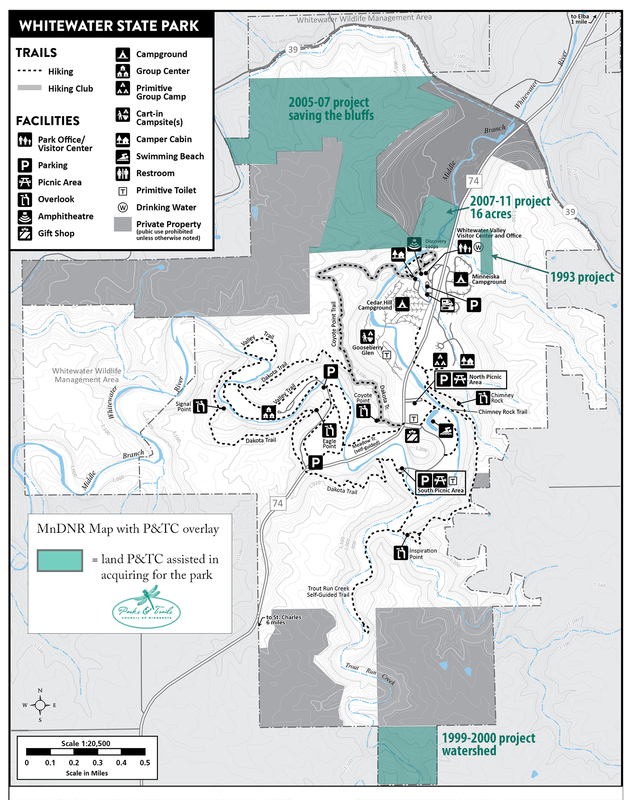 These projects provide high quality outdoor recreation, preserve natural diversity, and enhance connectivity for parks and trails. Visualizing this impact takes many forms. Some projects are small in scale but tremendous in impact, like when we preserved the bluffs overlooking the visitor center at Whitewater State Park. 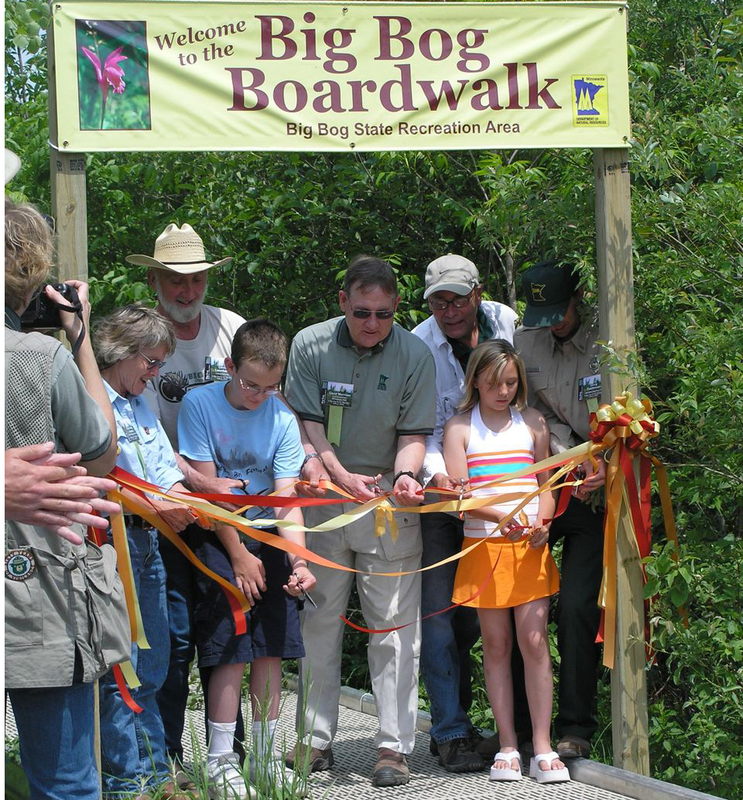 Park staff and Friends of Big Bog at the grand opening on June 4, 2006. 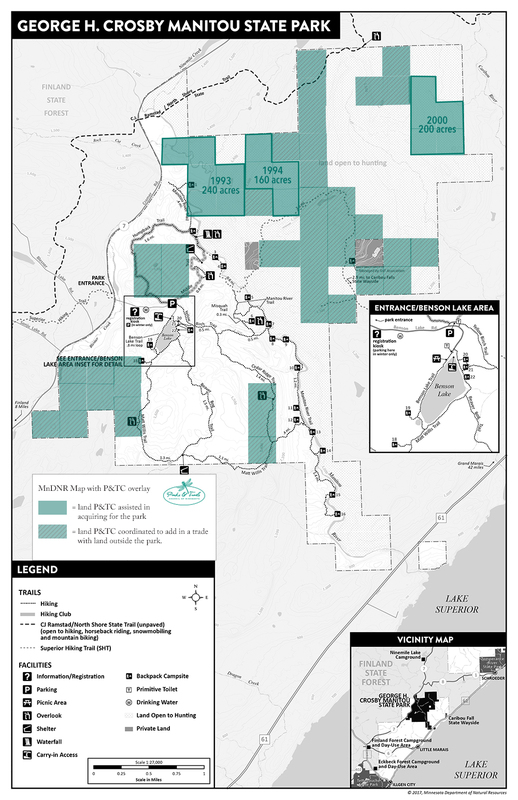 We work with many partners to ensure that urgently needed land is acquired for parks and trails. Each project always includes a public partner who eventually assumes ownership of the land and manages it for the public’s benefit. 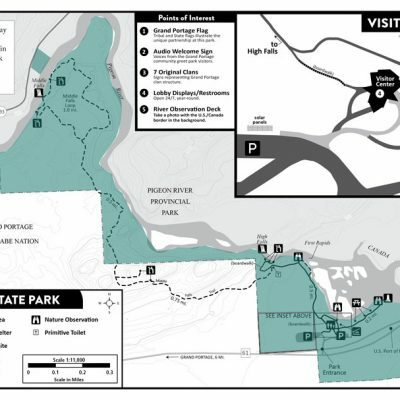 Our main public partner is the Minnesota Department of Natural Resources who manages Minnesota’s State Parks and Trails. Our other public partners are the many regional systems across the state. Occasionally we partner with volunteers such as friends groups or recreation groups. Not only do we work together to raise funds and plan for the future of the land, we also partner with friends groups to provide services to increase their capacity for future efforts in caring for the land. If you’re interested in partnering on a project, we encourage you to talk with us about submitting a land project application. Each project is as unique as the land we save. Here is the general steps that guide the process. We work with many partners to identify land projects. Sometimes it’s DNR or county officials who have a high priority project they need help with. Other times it’s recreation users or friends groups who alert us to critical land that’s needed for a park or trail. Our land acquisition application is a good way to let us know about an important project. An application may be submitted by a partner or by a member of our land committee. Our Land Committee decides to make a project active when it meets the key criteria. That’s when we begin rolling on laying the groundwork and getting all the legal and due diligence steps in order. We’ll also work with our partners to lay out a plan for working together. Sometimes that means jointly fundraising, managing the land temporarily, or simply knowing how the land will get incorporated into the park or trail. We begin discussions to learn about the unique situation of each landowner. Many landowners are delighted to see their land continue to be enjoyed as a park or trail. Others simply want to sell as quickly as possible. And still others involve multiple owners who don’t see eye to eye. We tackle all types of situations that are necessary to protect critical land for the public’s use and benefit. This is where our Samuel H. Morgan Land Fund is critical. This fund allows us to have the necessary funds at the ready to buy land when it’s up for sale. Timing is critical for land acquisitions. We buy when the land is up for sale and then hold it in trust while our public partner works to secure the funds or take any other necessary steps to add the land into the park or trail. 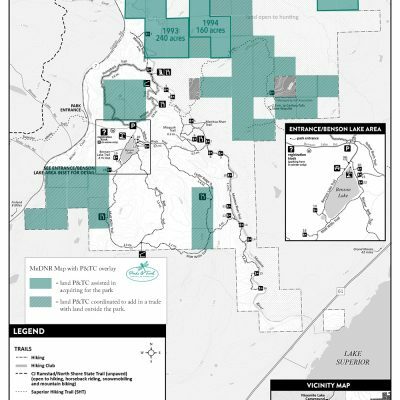 Without this partnership, land that deserves to be part of Minnesota’s parks and trails system would often be sold to private landowners and the opportunity to incorporate it into the park could be lost forever. Sometimes we help facilitate talks between the park or trail managers and others to make plans for how the land will be used. This could involve amending management plans to allow for specific uses, like climbing or bicycling on the land (see our Banning project). It could also involve cleaning up any unwanted structures (see our Sibley project). 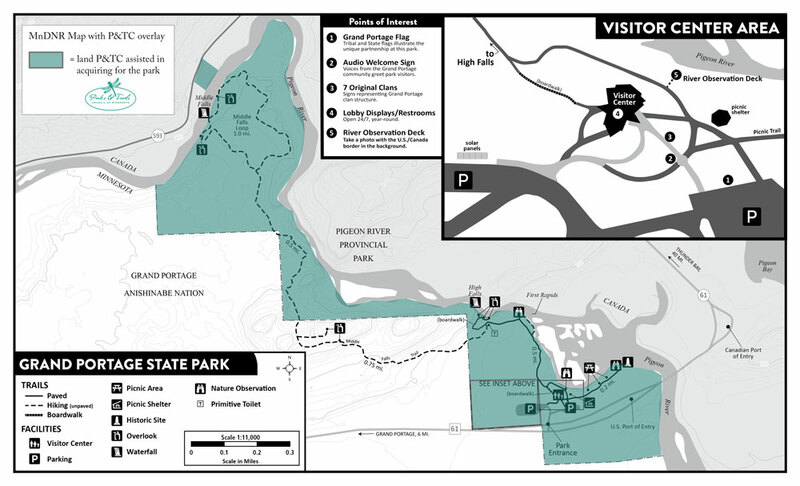 We work with the park staff to incorporate the land into the park or trail. This may take months or years. Our ability to hold the land in trust is sometimes the crucial piece that is needed, because we incurred the costs of owning the land while ensuring the qualities that make it an outstanding recreational place is protected.